Please refer to our stock # 385 when inquiring. Each doll has circa 12" ( 30 cm ) without bonnet , has pale bisque socked head with inset brown glass eyes , painted lashes and brows , slightly parted lips and open mouth with row of perfect teeth. Original blonde mohair wig over pate . Each doll has on five piece wood and composition body with original body finish and straight wrists , body has generally excellent condition .... note only at the doll in pink a small problem at one of her legs... please see my pictures !! The bisque condition of the Twins is generally excellent ..... free of damage , hairline or repair. Both are in un- touched condition , her orignal clothing are sewn of each body and was never removed . I think you understand that we could not show the body without clothing . Each doll wearing very beautiful in similar silk clothing like the other ..... one in light blue and the other in light pink ! Both are in the same dress style with lovely under garment , stocking and same leather shoes . Finally high brim lace wire bonnet with silk ribbon decoration. The Twins was preserved in her original presentation box ( both are in fragile condition as is ) !! Twins are very rare to find and special in un touched condition like this ones , they was made special for the French market and an Doll Shop in Paris .... an rare Store card was included at one of the doll´s from " Grand Magasin de Jouets d´Enfants " for Christmas ! 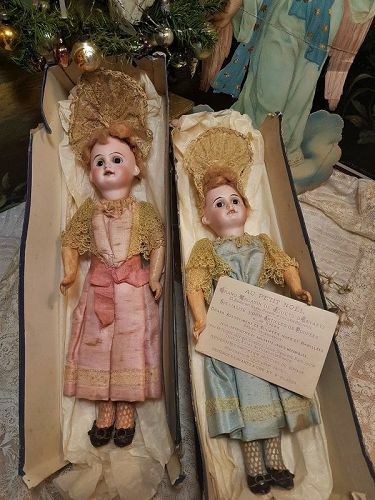 Both are a treasure for each good antique Doll Collection , it would be hard to find a similar one !! Please let me know if you have any question or if you need more or special pictures and thank you for your interest and trust on my Doll-Shop !!! Layaway are always welcome , please ask me about .... thank you ! !